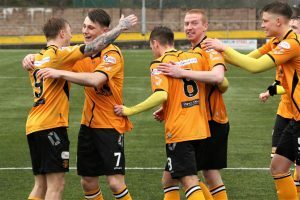 Annan Athletic recorded their second highest victory of the season over play off hopefuls Elgin City at Galabank on Saturday in front of their lowest home crowd of the season. It was a real blow to Elgin City’s play off hopes who now find themselves reliant on Stenhousemuir and Clyde slipping up in their remaining matches to have any hopes of making the play offs. You would have to go back to the 19th August 2017 to record when Annan scored as many goals, when they scored five goals against Berwick at Shielfield Park. So the meager crowd who turned up on Saturday had plenty to cheer especially in the second half as Annan completely overwhelmed Elgin who had fought back from a two goal deficit to get back into the match to 2-1 before Annan ran out convincing winners. Annan boss Peter Murphy started with the same starting eleven which secured a draw in the previous weeks home match against Berwick Rangers, it meant another starting place for youngster Ayrton Sonkur at the centre of defence who partnered Steven Swinglehurst at the centre of the defence. Elgin went into the match on good form following their 3 goal victory over Stirling Albion and they were forced to make one change from their starting line up with Andrew McDonald replacing the injured Cameron Eadie. The opening 20 minutes were fairly even, Elgin started the game promisingly without really testing Alex Mitchell in the Annan goal. Aidan Smith came close to opening the scoring in the 13th minute with a tidy effort from the edge of the box. Minutes later Henderson and Roberts combined to create a move which was promising but the end product did not match the build up. Annan opened the scoring in the 26th minute when a swift move from the middle of the park stretched the Elgin defence down the right with Aidan Smith and Scott Roberts combining for Scott Roberts to finish with a well flighted shot from the edge of the box which gave keeper Brett Long no chance. Elgin found it difficult to penetrate the Annan defence but in the final minute of the half the visitors created their best opportunity of the half when Shane Sutherland made the space on the edge of the box to finish with a low shot which flashed past the upright and outstretched arm of Mitchell. Annan started the second half promisingly, Aidan Smith squandered an opportunity in the 49th minute after being set up by Blair Henderson but a minute later Annan doubled their lead from a Sinnamon corner when Swinglehurst headed the ball into the path of Smith who finished clinically from close range hooking the ball into the net from 4 yards. It was a set back for Elgin but the visitors started to impose their authority on the match enjoying their best spell in the match. Jordan Allan tested Mitchell with a well struck shot in the 60th minute and minutes later the same player’s header from a Nathan Flannigan cross struck the base of the post. Elgin were rewarded for their persistence in the 68th minute when Flannigan picked out Shane Sutherland who guided the ball past Mitchell from close range. Stephen Bronsky then missed a good opportunity to square the game in the 70th minute when he failed to connect from a corner. A couple of quick substitutions from Annan then gave them the lift that they needed and in the 79th minute it was one of the substitutes Connor O’Keefe who finished superbly with a low shot from 12 yards after a move down the right stretched the Elgin defence with Scott Roberts picking out the on loan St Mirren man. Annan started to pile on the pressure in the closing stages of the match Cameron Salkeld combined with O’Keefe in the 82nd minute with keeper Brett Long pulling off an important save to deny O’Keefe. Blair Henderson finished off a good afternoon for the home team in the 86th minute when the striker collected a pass from O’Keefe to finish with a low shot from 7 yards. Annan Athletic Alex Mitchell, Jack Brannan, Evan Horne, Jamie Henry ( Connor O’Keefe 73 min), Ayrton Sonkur, Steven Swinglehurst, Owen Moxon, Ryan Sinnamon, Aiden Smith, Blair Henderson ( Ben Armour 88 min ), Scott Roberts (Cameron Salkeld 82 min), Subs not used – Jim Atkinson, Scott Hooper, Zac Hannay, Peter Murphy. Referee – Duncan Williams, Assistants – David Roome and Andy Taylor. Peterhead and Montose are still locked together in the fight for the title, Montrose recorded the biggest score of the day defeating Stirling Albion 5 -0 at forthbank and Peterhead returned from Berwick with a 3-1 victory. Stenhousemuir consolidated their play off aspirations with a convincing 4-1 victory over Edinburgh City. Cowdenbeath lifted the points with a one goal victory over the in form Clyde to keep alive their slim hopes of moving off the foot of the table. It is going to be an interesting 3 weeks with places at the top and bottom of the leagues still to be decided. Next weekend Annan travel to Stenhousemuir.